Could it be from the doomed Malaysian Airlines flight? INVESTIGATORS PROBING MISSING flight MH370 collected more debris on an Indian Ocean island today. Malaysia has urged authorities in the region to be on alert for wreckage washing up on their shores. 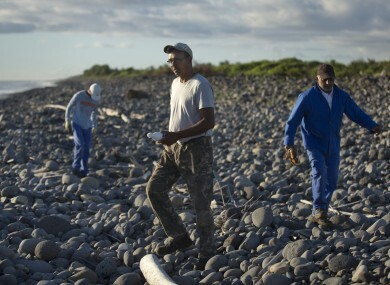 Locals on La Reunion island have been combing the shores since a Boeing 777 wing part was found last Wednesday, sparking speculation it may be the first tangible evidence that the Malaysia Airlines plane crashed into the Indian Ocean. However, authorities cast doubt on whether the new debris was linked to MH370 and a source close to the investigation in Paris said “no object or debris likely to come from a plane” had been placed into evidence today. The plane disappeared in March 2014 with 239 people on board. Early today an AFP photographer saw police collect a mangled piece of metal inscribed with two Chinese characters and attached to what appears to be a leather-covered handle. Also today, a man handed police a piece of debris measuring 70 centimetres (27 inches), guessing it was part of a plane door. This is to allow the experts to conduct more substantive analysis should there be more debris coming onto land, providing us more clues to the missing aircraft. He also confirmed in a statement that the wing part found onWednesday on the French island had been “officially identified” as from a Boeing 777 — making it virtually certain that it was from missing Malaysia Airlines flight MH370. Email “Island 'on alert' as more plane wreckage washes up”. Feedback on “Island 'on alert' as more plane wreckage washes up”.